Shaker Thumbs is your opportunity to give a thumbs-up or thumbs-down to a product or service you have used and that you'd recommend to other Shakers or warn them away from. 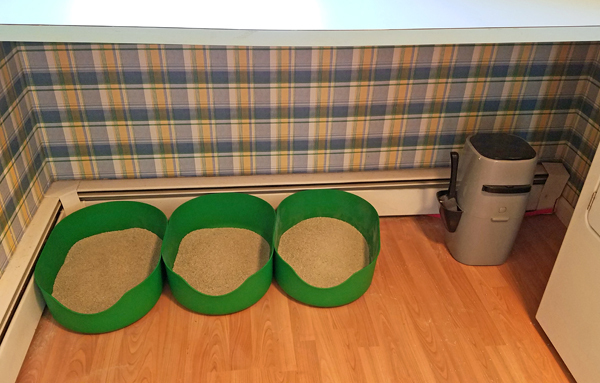 Today I'm giving a big thumbs-up to Ikea's Lurvig litter boxes! Three downstairs; there are two more upstairs. I got the green ones; they also come in black and white. And they are only $4.99! We've had them for a few months now, and the cats like them. They're far more attractive than most litter boxes, and the cats make no more mess in and around them than most boxes — probably slightly less. Olivia is a big, long-bodied cat, and she fits fine in these boxes. Honestly, it seems like the oval shape visually encourages her to stand in a way that looks more comfortable than she looks in rectangular boxes. Cats and their circles! So thumbs up! Especially on that price. Anyway! Give us your thumbs-up or thumbs-down in comments!